Stop chasing late payments. 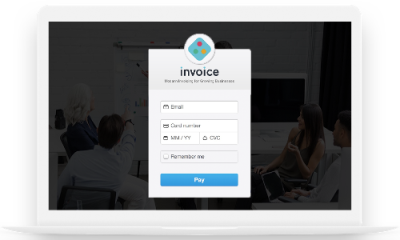 You can start accepting online payments on sent invoices today. No surprise fees. Funds from your paid invoices are deposited into your bank account as fast as the next business day. With Invoice, you can accept all forms of local and internation credit cards ranging from MasterCard, Visa, Verve, American Express. All forms of transactions are secured with the best encryption algorithms in the market. Making Invoice secured for you to do business. We provide your thousands of customers like you with a seamless payment experience through beautifully designed invoices that speak your brand language. 1.5% + N100 for local transactions and 3.9% + N100 for international transactions. What types of payment cards do you accept? We accept payment via mojority of payment card including Visa, Mastercard, Verve, Discover and American Express. Received funds are remitted by requesting a payout when needed. Funds will be remitted to your bank account within 24 hours after payout request. Is payments in other currencies available? Not yet - Processing and accepting foreign currencies is in the pipeline. We will keep you posted once available.